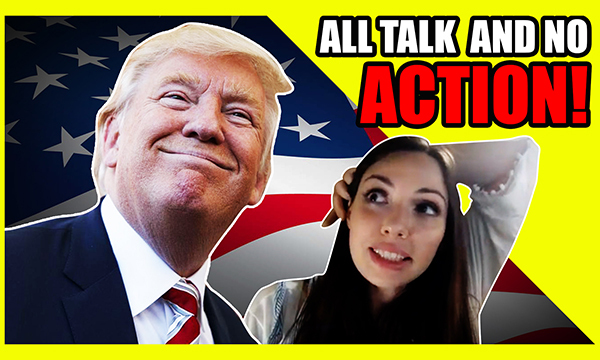 Alright so in this video we are going to be talking about all things related to u.s. foreign policy specifically Tulsi gabbard Trump State of the Union Syria Iran Venezuela Afghanistan plus most importantly will the u.s. troops come back from Syria and Afghanistan and to discuss that we have partisan girl Mimi who is a researcher has excellent sources on the ground and will provide you important information. Most likely you won’t get anywhere else know Mimi Donald Trump State of the Union was yesterday and he was discussing a whole bunch of things he boldly came out against cancer child cancer AIDS and the Holocaust but most is seriously what was really fascinating about the state of the union is to see kind of kind of this duplicitous talk that we’ve been seeing from the Trump Administration with him pledging to end the endless Wars in Syria and Afghanistan while at the same time we’re seeing Tapper talk than ever and Donald Trump demonstration looking at Iran and Venezuela. Those are those are nice countries and it would be a shame if someone would intervene in them so duplicitous talk what’s your take on it mean. It’s certainly do if you look at the iran-iraq war your Trump has recently also mistake. Soon as was it yesterday or the day before. Why not I think it’s because those Wars. 10 years ago they want to get out because it’s costing a lot. Surgeons can continue to hide their know whatever you want to call the resistance insurgent. She has it in her to pull out. Be killed in the street in the masks to the states. What they have now is an occupation. The east of the Euphrates which is very unsafe for first of all. I’m not popular in the people that live in the area that. Not only because the guy that is supporting SDF. Groups that are supporting Vista. Donald Trump even mentioned yesterday during the State of the Union that over 7,000 us Personnel have already died with this kind of war on terror which as he was promising during his campaign speeches when he was running to be president would end so it’s interesting to see him at the same time being like okay let’s get out with MD let’s end this endless Wars but then be like hey you run over there oh yeah we still got to deal with that problem but again a lot of the information that we’re getting about these issues of a or of course I’m not heard I mean even the very fact that just a few days ago the United States bombed a Syrian government position and killed Syrian government troops is nowhere to be found you of course I’ve been reporting on it also the very important fact that actually more US troops are being sent into Syria right now to supposedly prepared for the withdrawal again we have to be skeptical your because this Administration. Has been saying one thing doing another thing and it’s very unpredictable but we’re going to give you the best analysis we can about this so I want to hear kind of point of view here cuz you’re highlighting also very important details and movements of a lot of these larger Terror groups what are going to be the bigger kind of ramifications if. Do u.s. soldiers actually get out of there and do you think they will actually get out of Siri. What is or not about the withdrawal is something we like to question. It’s possible that’s the reason why they haven’t is the Deep state. Make in the first place. I think it was that supports Trump that thinks it’s too risky to stay in Syria US soldiers and turkey or US Army. What is happening on the ground you say that US soldiers were sent in because. You know what would happen if the US Military. It’s not the fact that turkey is a risk to Syria and courage so by trying to push the negotiated and put you in the war and they only increasing the risk. It needs to be two-fold not only should also these ministers that has it all these pools host of Syria’s population. These places are mixed with different ethnicities. Might make them feel that they can continue. Push for federalism. Just going to cause this whole Quest. How to drag on a potentially cause. PreviousI’m Even Shocked and Stunned At What CNN Just Did! NextIs Tulsi Gabbard Legit? Or To Be Trusted?